1. Can we order online and collect at the shop? 2. Will my item be lost during shipping? No, we provide doorstep delivery with tracking code. For more information, please click here. 3. Do you provide international shipping? Please email us at info@thelovelypets.com for the shipping rates. 1. Can I drop off my pet in the morning and collect back after I end work? Yes. We will call you once we finish grooming your pet. You may pick up your pet anytime before 6.30pm. 2. How useful is the microbubble spa? This Japanese technology can soothe skin irritation and remove accumulated dirt on the skin. Containing negatively charged anions, the small sized bubbles can penetrate deep into the skin and siphon away dirt and debris. Skin becomes very smooth upon instant contact. Even our human hands become smooth and we are very happy using this equipment. There is no harsh chemicals added. 3. Can I bring my own shampoo for you to use? Yes. We select Silky shampoo because other shampoos hurt our own human hands and that will affect the dog/cat as well because we are all mammals. And Silky has been proven effective in solving many skin problems. However if you insist in us using your own shampoo, we oblige. 4. My pet can be aggressive during grooming. Do you accept aggressive pet? For the safety of the pets and our groomers, it is best that the pet is trained and rehabilitated by a professional first before being groomed. Usually we can earn the respect of the dogs and cats by showing their unique body language and tones. We will accept or decline on a case by case basis depending on your pet. 5. Can I bring my pet which has flea/ticks for grooming? For the safety of other pets in our salon and those that are going to be in our salon, we would recommend that the dog/cat be given anti flea/tick medicine(which we sell) and then come back for grooming 3 weeks later. The life cycle of the insects are about 3 weeks. We strive to keep our salon free from tick and flea. Kindly inform us if you already found a tick before your grooming appointment. And before a pet is brought into our grooming room, it is our protocol to do a check on them. 6. My pet's fur is badly matted, but I still want a certain style for my pet, what should I do? The best way to prevent tangling/matting is frequent brushing. Just 5 minute a day while you watch TV or while cuddling your pet will go a long way to prevent matting. a. Matted fur does not allow for air circulation to the skin and will not dry properly causing hot spots, bacterial and fungal infections. b. Fleas, tickets, maggots, and other parasites may be lurking in the coat causing further skin infections. c. Matted fur also pulls and binds, causing pain to your pet when they move or lay on mats. The skin underneath is usually raw and inflamed. The matted hair rests tightly against the skin and the only way to remove it is to use a short blade clip between the skin and mats. There may be existing skin problems underneath which may not be visible because the matte was covering them. Afterwards, your pet may show signs of skin irritation and sores due to the matting, wet undercoat, and dirty undercoat. Our groomers are very careful but the possibility of injury exists as we have to work so closely to the skin to remove the matted coat. 7. Can you cut my dog's nails really short? We will do our best to trim the nails without cutting the quick (the part with nerve endings and blood vessels) to avoid pain and bleeding. We will not knowingly hurt your dog to cut the nails really short! The more frequently the nail is trimmed, the more the quick recedes back, which results in shorter nails. Other salons might cut very very short. The dog would bleed and scream in agony. Then they fix it with a powder and problem seem to be solved. And it is fast and easier to do. However, the dog became traumatic towards grooming. And it is very painful. We are against this sort of practice. Safety first, fashion last. 1. How do you remove tear stain, paw stain and mouth stain? Easy, but it takes about 1-2months of correct actions and avoiding certain products. THEORY: That brown stuff is yeast intertwined with the hair. It cannot be taken away from the hair, but we wait for the hair to fall off and get replaced with new hair and then the new hair must grow uninfected. This is the plan. Now the yeast must not be given water. And it has to be kept dry all the time. For tear stain, the source of water can come from the eyes crying cos of harsh chemicals (shampoo and pet wipes and the "tear stain remover" eye drops which ironically dont work!). For mouth stain, source of water is from drinking greedily (cos dog is overthirsty from eating kibbles, or itchy from shampoo). And for paw stain, the dog was licking it cos he was feeling itchy from the shampoo. Keep the area dry. Use dry tissue to wipe the area dry 2-3x a day. (After this is gone, you don't have to do it anymore cos the area will always be dry. So just be disciplined to do this for the 2 months, then the rest will be easy). 2. I spent $thousands on vet bills for our dogs' skin issues in vain. And you guys show amazing before-after photos. What are the usual causes of skin problems for my dogs? Most of the time, it is the shampoo. Even medicated shampoo are harsh. Some medicated shampoos are good in short term, but can cause dandruff in the long term. This is from our experience. Secondly, it is the food. Kibbles can contain preservatives, MSG, and other chemicals that's not good for the long term health. Thirdly, and we see this very often, dog owners do not dry their dogs thoroughly. They miss spots like the armpits, behind ears, and underbelly. And it is no surprise that these areas are where the spots of skin problems are. The last instance involves mites. Mites are microscopic and we cannot see it or remove physically. This can be solved by Revolution and a good healthy nutrition. Sometimes injection/pills from the vet is needed for very serious cases. 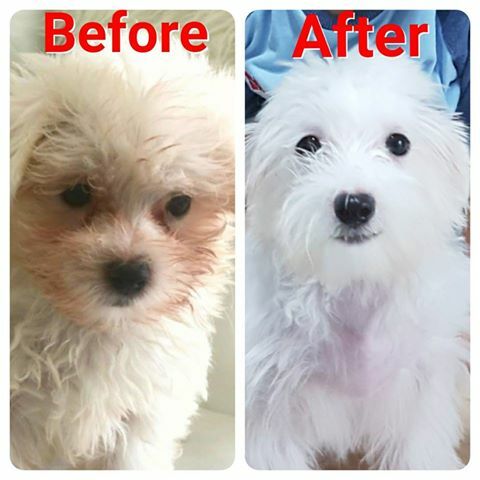 When you book grooming appointment with us, please bring it up to our attention if your dog has skin problems. Or email us with pics to info@thelovelypets.com. If we think your dog needs vet attention, we refer you to our trusted vets. We are truly dedicated in helping your pets live a better and happier life! 3. How to treat wounds? Really similar to humans as we are both mammals. When a mammalian skin is cut, injured, opened, blood will come out. Part of the blood called the platelets will detect that there is an external environment to be shielded away from the body. Hence it clots up to protect the internal body. The clots can appear as brownish scabs. DO NOT PLUCK THESE SCABS. These scabs will eventually fall off by themselves. But they are itchy sometimes and we have to avoid the dog from scratching these clots way too early. We love to use aloe vera plant. The real one. And they do amazing job in treating wounds. All natural, not costly. 1 potted plant cost $10 from plant nursery, but it grows so fast and can propagate wildly.